Once synonymous with the college student’s favorite insta-meal, ramen has found its way into the hearts of American diners — thanks in part to the popularity of David Chang’s Momofuku Noodle Bar restaurants. 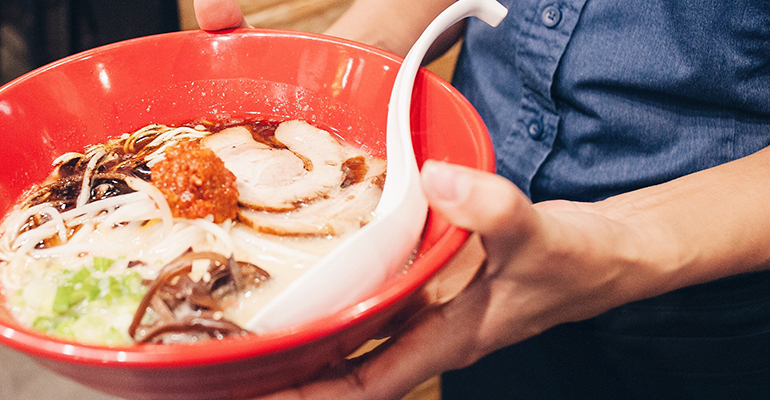 Ramen mentions on menus have increased 46 percent over the past four years, with 13-percent growth in the past year alone, according to Datassential. 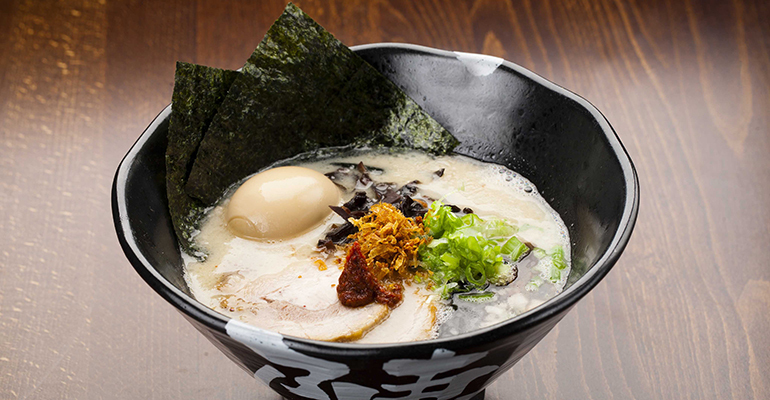 But most of the growth in ramen thus far has been seen in independent restaurants on both the East and West coasts. As Americans embrace the more authentic version of noodles in rich broth in its various forms, however, several chains are emerging with the hope of bringing ramen to the masses. Most of these concepts are Japan-born with a scalable model well proven around the world. But all face the same challenge of translating an authentic experience to U.S. diners largely unfamiliar with the dish. Four restaurant chains are worth watching as the race to become the number one ramen brand in America heats up: the sleek Los Angeles-based Jinya Ramen Bar, and Bellevue-Wash.-based Kizuki Ramen & Izakaya are executing rapid expansion plans in new markets. Out of New York City comes both Ippudo and Ivan Ramen, which are growing with the help of investments from Panda Restaurant Group and private-equity firm Corlex Capital, respectively. 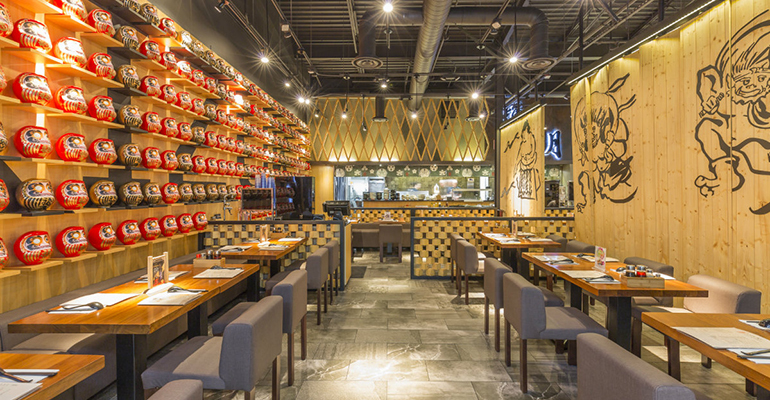 Operated by the La Brea Dining Group, based in Los Angeles, Jinya Ramen Bar — specializing in customizable tonkotsu ramen and small plates — was founded in 2000 by Japanese restaurateur Tomonori Takahashi, who opened the first location in Tokyo. Takahashi opened the first U.S. unit in Los Angeles in 2010, when he also created La Brea Dining Group. Now the brand has a presence in 11 states, as well as Washington, D.C. and Canada. And La Brea Dining Group is growing four concepts in the U.S.: the original casual-dining Jinya Ramen Bar, the fast-casual Jinya Ramen Express, the customizable ramen and sushi concept Bushi, and Robata Jinya, bringing the total number of Jinya brand locations to 33, of which 29 are franchised. By 2020, Clay Sanger, the group’s chief operating officer, said Jinya expects to expand to 100 units across North America, and nearly all will be franchised with the exception of a company-owned Jinya Ramen Bar in Encino, Calif., scheduled to open in spring 2019. The company has plans to open flagship locations in New York City, Miami and San Francisco by 2021. Jinya, however, attempted to open shop in New York City in 2013, but closed after one year, saying the company chose to not continue the lease. Jinya Ramen Bar has nine planned openings for 2019, including Baton Rouge, La. ; Dallas; Vancouver, B.C. ; Houston; Atlanta; Los Angeles; Denver; Las Vegas; Washington, D.C.; and Kansas City, Mo. The company is also planning to open 45 more Jinya Ramen Express units, with concentrated expansion in airports. The average check at Jinya is $20 per person, not including alcohol, and the standard restaurant size is about 2,800-square feet. Sanger said Jinya’s menu of build-your-own ramen bowls has been one of the key factors contributing to their success. “People want to customize their dining experience and ramen is the ideal vehicle for this,” said Sanger. Sanger said that the long-term goal is to open 250 restaurants across North America by 2023 and for Jinya to become the number one ramen restaurant brand in the country. 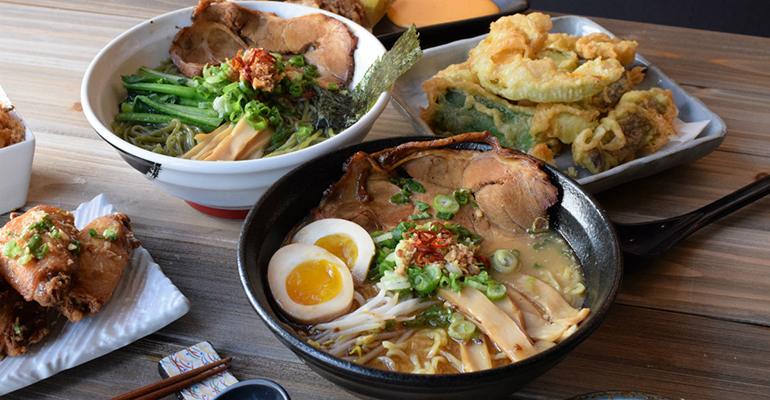 Kizuki Ramen & Izakaya, based in Bellevue, Wash., is the 10-unit American outpost of the Japan-based chain Kukai Ramen & Izakaya, which includes 12 units in Japan and two in Taiwan. The goal is authenticity, said Tony Pisa, a former Starbucks executive who was named Kizuki’s chief operating officer earlier this year. Pisa said that the Kukai chefs from Japan came over to the United States to teach the Washington-area chefs the proper way to make authentic ramen, from simmering the broth for 12 to14 hours, to importing ingredients from Japan. Pisa also said that every time they open a restaurant, they fly in their Japanese designer to make sure every one of their approximately 3,000-square-foot restaurants has the same atmosphere as it does in Japan. Pisa’s long-term goal over the next five years is to expand Kizuki domestically beyond the Pacific Northwest to both major and smaller markets, although he remained tightlipped about their exact plans. Although a few of their units are franchised, Pisa said their focus right now is company-operated units. He also hinted that he is open to exploring investment options with potential private-equity firms, although would not comment on specifics. Kizuki Ramen’s menu features several ramen varieties, including tonkotsu, shoyu, and miso, for about $13 to $16 per person. Ippudo — the North American outpost of Japan’s iconic Hakata Ippūdō ramen shop, and one of the first pioneers of tonkotsu-style ramen in North America — opened its first location in New York in 2008. The concept got a significant boost from the 2017 investment from I&P Runway, a partnership between Japanese holding company Chikaranomoto and Rosemead, Calif.-based Panda Restaurant Group, the parent company of Panda Express. With more than 240 units worldwide, Ippudo has expanded to California, with units in Berkeley, San Francisco and Santa Monica. But Ippudo isn’t stopping there. The 33-year-old ramen chain has plans to open 300 locations in Japan and 300 more internationally — many of which will be in the U.S. — by 2025. The Ippudo brand began as a 10-seat ramen shop in Daimyo, Chuo-ku, Fukuoka city in 1985, founded by Shigami Kawahara, who in Japan is known as the Ramen King, according to press materials. Today, each of the company’s 240 stores worldwide seat about 60, and the concept is known for its signature bowls, the Shiromaru Classic, a Tonkotsu-style ramen, and the Akamaru Modern, a bolder twist on the original, with an average check of $20 per person. Ivan Orkin’s ramen journey has more of a Western spin than the other brands on this list. A Culinary Institute of America-trained native of Long Island, N.Y., Orkin fell in love with Japanese cuisine while teaching English in Japan and opened his first Ivan Ramen shops in Tokyo in 2006 and 2010, respectively. Now Ivan Ramen also includes two locations in New York, and Orkin has an appearance on Netflix’s “Chef’s Table” on his resume. He is reportedly poised to launch a franchised ramen concept that could reach 100 units over the next five years, according to Eater. The project is backed by private-equity firm Corlex Capital LLC, which has signed a letter of intent to invest in Ivan Ramen to develop an “American urban casual prototype” with future plans to franchise, as well as related consumer packaged goods, according to press materials. “When I decided I was ready to take my concept to the next level, I invested a great amount of time and energy into finding the right partner that had the ability and experience to scale my brand,” Orkin said in a statement. The new Ivan Ramen shops will be a mixture of Ivan’s pre-existing New York City locations: the full-service Ivan Ramen and fast-casual Ivan Ramen Slurp Shop. According to Eater, the new restaurants will serve several varieties of ramen, including soy-sauce-based shoyu, tonkotsu, and mazemen — the latter a no-broth, garlic-based ramen. The menu will also include Japanese appetizers and a craft beer program. Neither Ivan Ramen nor Corlex Capital responded to requests for more information at press time. Boutarel of New England Consulting Group said whoever wins the ramen wars will likely be the concept that keeps an eye on broader branding, not just rampant expansion. “For a ramen concept to succeed in today’s environment, we believe the restaurant should leverage branded ingredients as a proof of product quality, and must offer delivery and perhaps even meal kits,” he said. CLARIFICATION Nov. 28, 2018: This story has been updated to clarify that La Brea Dining Group operates and franchises the Jinya brand restaurants in the U.S. only. The restaurants in Japan are operated separately. CORRECTION Nov. 29, 2018: This story has been updated to correct the number of seats at Ippudo.